Fellow masters, it is time to rejoice with today’s news! One of the top played mobile games, Fate/Grand Order, is ready to celebrate alongside its English client players with a 5 Million Downloads campaign. The fact that the game has garnered enough attention to be downloaded 5 million times, has led to Fate/GO being more out in the public eye. At conventions last year, fans started seeing more of a presence from the mobile game, whether seeing Fate/Grand Order‘s booth at Otakon last year, or experiencing more panels where a English team representative was able to connect with the crowd in a more intimate way. So at the beginning of 2019, Fate Grand/Order announced they would be kicking off the U.S.A. Tour this year in Los Angeles, California, with special guests and new exhibits to premiere. While subject to change — and hopefully to be expanded to more stops — the tour is currently expected to attend Anime Central, Anime Expo, Anime Weekend Atlanta, and Anime NYC. Thankfully you don’t have to wait for the tour to celebrate the growth of this game, as players will be receiving various rewards in celebration of the 5 million downloads. This includes daily log-in bonuses, increased success rates for leveling Servant and Craft Essences, as well as the quest to acquire the Royal Brand Mystic Code returning. 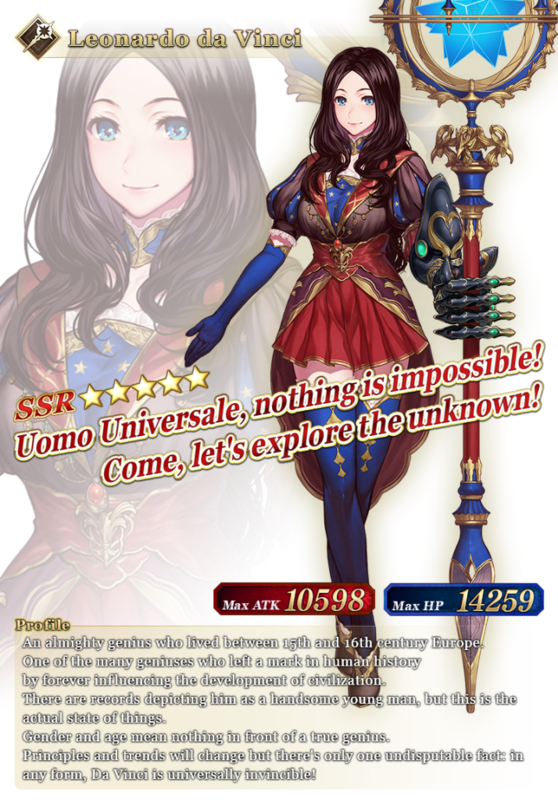 Players also get to see the return of Leonardo da Vinci, the limited time ★5 (SSR) Caster class Servant. She originally showed up just before I began playing the game myself in July of 2018. Those looking to try and land her with a summons will find that her summon rate has been increased. This celebratory campaign will begin on January 20th 2019, and is set to end on February 13 2019. Leonardo da Vinci herself will be around until February 6th. So save up your Saints Quartz and Summon Tickets if you missed her last time, or just want to boost your Noble Phantasm on an already acquired copy of her. Players will also see a change in daily login bonus material from Evil Bones to Void Dust. For those unfamiliar with the game, Fate/Grand Order is a game that brings together much of the FATE universe, where you summon Servants and Craft Essences that you can enhance to make your team more powerful. It has a very deep story campaign that spans multiple chapters, as well as more personal Interludes that focus on specific characters. There is also farming missions available to help players get materials they need in their quest to max out their characters. My personal favorites are the events that Fate/Grand Order does regularly that bring along their own story and uniqueness. These events not only help the players out with free servants and easier to obtain materials, but it helps spice up the game in a way that doesn’t allow the game to wear out its welcome. You can download Fate/Grand Order on Apple App Store and Google Play.